Early one morning in a London neighborhood, a man waits on a park bench for the sun to rise—only, he is no man, but something far older that lurks in the night and feeds upon blood. His mate, as old or possibly older than himself, had committed suicide the week before in the exact same manner on the same bench in the sunlight. However, in his final moment, something unexpected happens: a mugger tries to take the Old One’s money, threatening him with a knife; and although the Old One vanquishes his attacker and lets himself be engulfed by flames, he overlooked one detail: The mugger’s knife managed to cut its target. In the hours and days and weeks following, the knife cuts other people, some by accident and some on purpose, passing the Old One’s blood into them . . . and with it, his spirit, soon spreading into an ever-increasing number of hosts as a shared consciousness. Despite his rebirth, the Old One is only interested in lying low and passing into darkness—but to do so, he must reclaim that knife. And with a growing trail of bodies, the Old One (in his growing number of vessels) is now being hunted by police . . . as well as by someone else. Yes, this is a vampire novel, but not one which aims for dramatic pathos. These are truly the vampires that stalk the night in the bodies of the dead, haunting and supping upon the blood of the living. Markham manages to treat the vampires of his novel in a classically terrifying sense, while infusing them with brilliant new ideas and themes in this refreshingly original tale. Throughout the novel, Markham manages to avoid referring to the Old One and his vessels as vampires. In some ways, this enhances the tension, bringing new life into the overdone trope by treating it as a creeping menace—yet without focusing on characters stopping to question and figure out what’s going on. 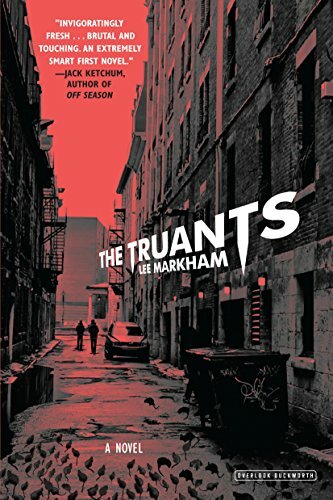 The Truants is very intentionally set in the streets and amongst the inner-city youth of contemporary London, living with poverty, grime, drugs, and gangs. With this gritty backdrop, the gothic tropes of nocturnal bloodlust are redefined into something more akin to the threat of street-level tension, with the horror nicely doubling as a socio-political conversation. But again, make no mistake about the true nature of this book: It is a horror novel, and it is scary. There are some powerfully unsettling scenes, especially when the Old One’s multiple-host presence comes into play. There are merciless deaths of children and women and even animals, as well as of men—and of course, this being a vampire novel, with death comes un-life. Besides the refreshing take on the mythology and presentation of the vampires, The Truants also showcases some impressive storytelling acrobatics, with the narrative shifting from suspenseful third-person descriptions to moody and ominous first-person accounts from the Old One. The knife serves the plot as more than a McGuffin; it represents an ongoing dilemma for the Old One and an encroaching force upon the lives of the innocent humans who possess it. In some ways, it is a character unto itself. There are deliberate shifts back and forth in the timeline of events as the Old One moves (and spreads) about, and as other characters are affected by his actions. At times, these narrative shifts can be a little jarring, disorienting, or even confusing, but it all comes together very organically in the end.